BU's latest attempt to clinch sole possession of the Hockey East regular season crown started terribly and ended with a third-period rally that fell just short as Northeastern defeated the Terriers, 6-5. The teams conclude the regular season with a rematch tonight at Matthews Arena that will air on NESN. Puck drop is at 8 p.m. The Huskies bottled up BU with an aggressive forecheck and prolonged puck possession to take a 3-0 lead scoring all three goals in less than two minutes. BU quickly responded with two late scores—by sophomore Nick Roberto and senior assistant captain Evan Rodrigues—to cut the margin to one. However, the visitors dominated the middle period, too, with three more goals to stretch their lead to 6-2. Rodrigues’ second goal in the final minute of the second period triggered the comeback and Ahti Oksanen’s 20th of the season, a power play goal just 39 seconds into the third, brought BU’s deficit down to two. With BU dominating play, a Brien Diffley slap shot sailed past Northeastern’s Clay Witt at 8:41, but was waived off due to a Terrier in the crease. Rodrigues completed his hat trick with a power play goal at 14:17 to make the score 6-5; but that was as close as BU would get, despite two minutes of extra-attacker time. Junior goalie Matt O’Connor gave up the first five goals and was pulled in favor of freshman Connor LaCouvee who yielded the final NU goal. "We're gonna find out a lot about ourselves tomorrow night." Junior Danny O’Regan assisted on three goals, while freshman Jack Eichel and junior captain Matt Grzelcyk each had two helpers. 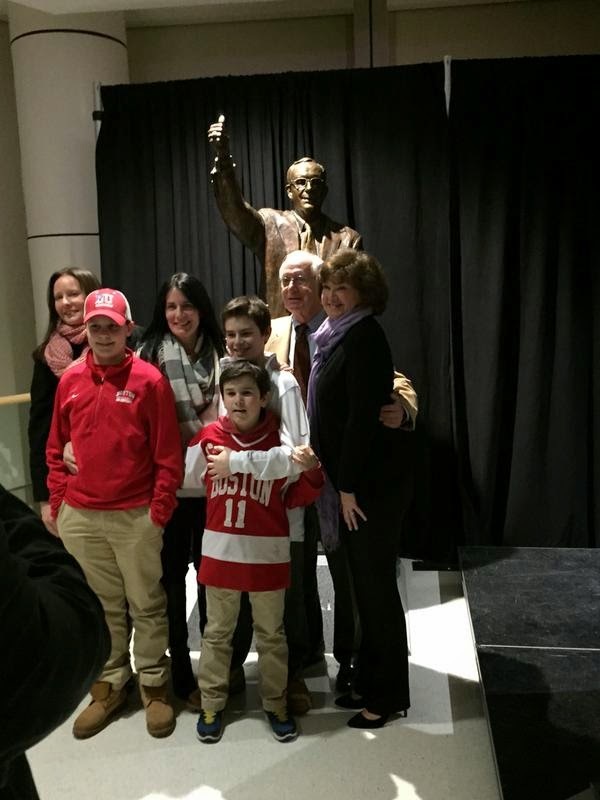 ► Prior to the game, a statue of former BU head coach Jack Parker, who led the Terriers for 40 seasons, was dedicated at a private ceremony attended by donors and members of Coach Parker's family. 2015 recruit Charlie McAvoy scored and added an assist for the NTDP U18s who defeated Green Bay, 5-2. For the right-shot defenseman from Long Beach, it was his seventh goal of the season and 26th point. 2015 recruit Maxim Letunov had an assist and a shootout goal for Youngstown in its 3-2 win against Fargo. With 51 points, he’s tied for third in USHL scoring with fellow 2015 recruit Robert Carpenter, who scored his 26th goal of the season for Sioux City in its 4-3 overtime loss to Tri-City. Led by junior Kayla Tutino’s Hockey East tournament record four-goal performance, the #7 Terriers produced a dominating effort in their first post-season game, routing Vermont, 8-1. Captain Marie-Philip Poulin also set a tournament record with four assists. 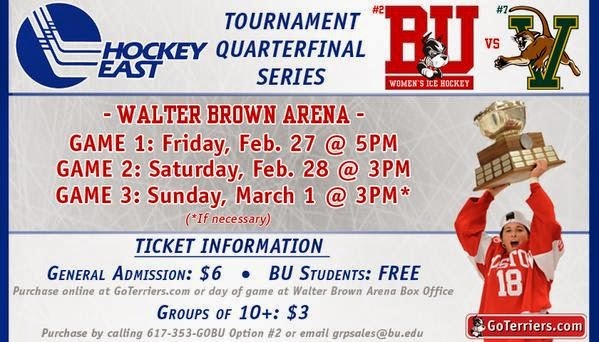 BU can close out the quarterfinal series today in game 2, which begins at 3 p.m. at Walter Brown Arena. BU jumped out to a 5-0 first-period lead on three Tutino goals and a pair from freshman Rebecca Leslie. After Vermont got on the board in the second period, Tutino’s fourth and a goal by Rebecca Russo extended the lead to 7-1 after two. Dakota Woodworth closed out the scoring late in the third period. Victoria Hanson stopped 22 Catamount shots to earn the win. 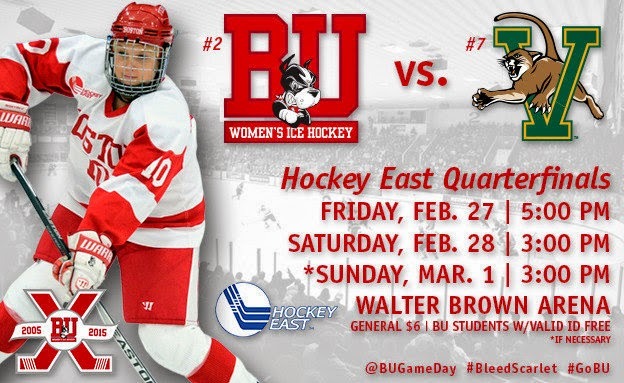 #4 BU takes on Northeastern tonight in the second of three meetings this week. Monday’s 4-3 overtime win was for the Beanpot Championship. At stake tonight for the Terriers is a chance to claim the Hockey East regular season title all by themselves. 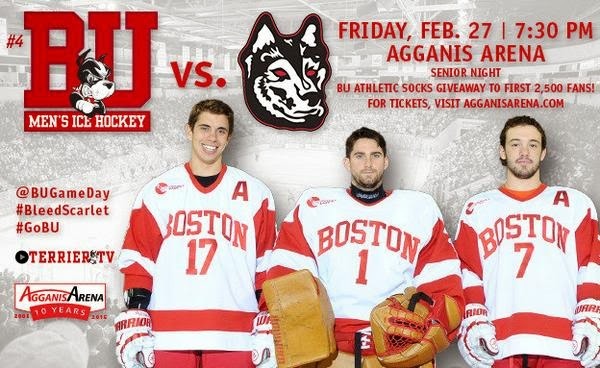 Gametime at Agganis Arena is 7:30 p.m. with Senior Night activities preceeding the contest. Senior assistant captains Cason Hohmann and Evan Rodrigues, along with goalie Anthony Moccia, will be honored. ►Cason Hohmann is a featured guest on this week’s Inside Hockey East podcast. ICYMI, Hohmann was featured in a Daily Free Press story yesterday. ► A final Beanpot story from SB Nation’s Joshua Kummins: Championship Fun Facts & Stats. 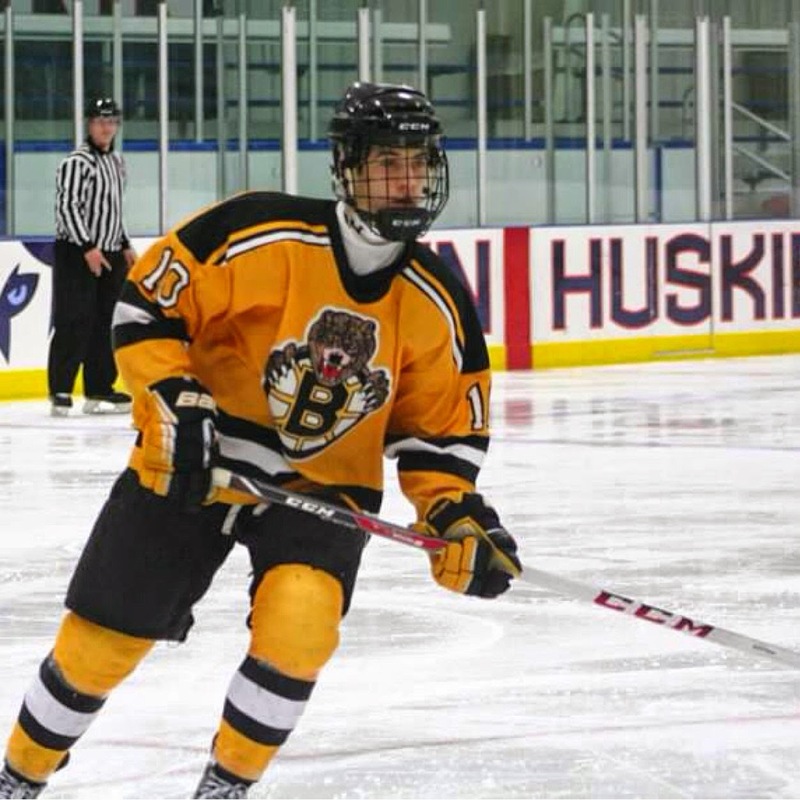 BU has received a verbal from Junior Bruins (USPHL Premier) left wing Ryan Cloonan. The Longmeadow, Mass., native, who has 65 points (20G, 45A) thus far this season, is expected to join BU’s 2016 class of forwards, which includes Clayton Keller, Kieffer Bellows and Johnny McDermott. A 1995 birthdate, Cloonan had originally committed to Maine several years ago, but decommitted due to a coaching change. Cloonan is a small forward, but he's shifty and has good hands. A gritty player who's not afraid to go into the dirty areas, he's got really good speed as well. 95 F Ryan Cloonan (@BostonJrBruins Premier) commits to BU. Slippery local talent for the Terriers, scores, makes use of space. 65 pts in 50. Former Terrier Adam Clendening, holding down a regular spot on the Vancouver blueline since his trade from Chicago, returned to hometown Buffalo with the Canucks and spoke with the Buffalo News. #7 Terriers begin their best-of-three Hockey East quarterfinal series today against Vermont. Puck drop at Walter Brown Arena is at 5 p.m. Saturday and (if needed) Sunday will have 3 p.m. starts. BU won two of its three meetings with the Catamounts this season, most recently a 9-2 win at home with seven Terriers finding the net. Episode20 of Inside BU Hockey features Bernie Corbett’s interviews with Coach David Quinn, freshman Brandon Fortunato and former All-American goalie and Olympic hero Jim Craig. Fortunato, one of four freshmen on the Terrier blueline, is a standout passer who skates on BU’s second defensive pairing and power play. A late signing last spring, he becomes the 24th Terrier who played in USA Hockey’s NTDP program. Craig anchored Team USA’s gold-medal winning team in the 1980 Olympics, which celebrated its 35th anniversary last week in Lake Placid. In the “Miracle on Ice” upset of the Soviet Union in the semifinals, Craig stopped 36 of 39 shots. At BU, he split the goaltending chores with Brian Durocher for the 1978 national championship squad and was in net for the 5-3 title game win over BC. Craig earned All-American honors in 1978-79. ►Coach Quinn was Scott McLaughlin’s guest for WEEI College Hockey Puckcast, discussing the Beanpot, BU’s pursuit of a conference title, the status of goalies Matt O’Connor and Sean Maguire, and more. ►Sarah Kilpatrick’s Daily Free Press profile of Cason Hohmann explores the competitiveness that defines the senior assistant captain from Texas. ►Among 2014 NHL draftees, freshman Brandon Hickey’s stock has risen sharply, according to ESPN Insider Corey Pronman. "Hickey has been one of the season's biggest risers in my eyes, playing at a very high level as an 18-year-old freshman in a tough conference. Hickey skates very well, has above-average puck skill, is very physical and has been effective on both special teams for BU. His reads could still use a little work -- as the quality of competition jump from the Junior-A level shows at times -- but overall, his talent level and intangibles stand out. Hickey has emerged as a player who will make the next top 100 drafted prospects list." ►BU’s “I Like Eich” for the Hobey Baker Award video, promoting freshman Jack Eichel, has earned kudos from TSN and CBS Sports Hockey Writer Chris Peters, who posted a photo of the “I Like Eich” button and the 1950s “I Like Ike” button it was modeled after. The HockeyBuzz report on the Buffalo Sabres interest in netminder Matt O’Connor features interviews with O’Connor and goalie coach Mike Geragosian. 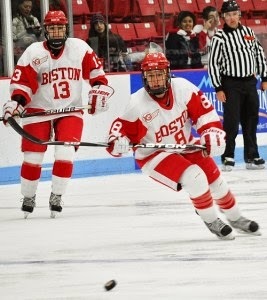 The junior from Toronto is expected to turn pro following this season and receive his degree from BU this summer. 2016 recruit Patrick Harper's hat trick (including the game-winner) and assist powered Avon Old Farms past Canterbury, 7-3. The left-shot center from New Canaan, Conn., has an (unofficial) 20-27-47 scoring line in 21 games for the Winged Beavers. He also skated in four games for the NTDP U17s. The Terriers host Vermont this weekend in a best-of-three Hockey East quarterfinal series. BU is the tournament’s second seed, while the Catamounts are #7. Game 1 is Friday at 5 p.m. at Walter Brown Arena with games 2 and 3 (if needed) set for Saturday and Sunday, each beginning at 3 pm. Captain Marie-Philip Poulin has been named as one of ten finalists for the 2015 Patty Kazamaier Award for the nation’s top Division 1 player.